He is the author of four books: Just Married & Cooking (Scribner ’11), Cognitive Cooking with Chef Watson (Sourcebooks ’15), The Great Cook (Oxmoor House ’15) and Finding Flavor (HMH ’18). Since 2008, he has operated Just Married & Cooking, LLC with his wife, Brooke Parkhurst. Their company creates one-of-a-kind, custom dining and educational experiences. Together, they also teach a series of date night cooking classes at The Institute of Culinary Education, where they inspire couples of all ages to get in the kitchen and create delicious food. For the past decade, Chef James Briscione has been at the forefront of groundbreaking culinary events that seek to combine unexpected ingredients in new and exciting ways. Most recently James was invited to speak at TEDxWarsaw to share his work and discuss the future of food. While a sous chef at Restaurant Daniel, James was cast in the pilot for what would become Food Network’s runaway hit series, Chopped, a competition show known for presenting its contestants with unexpected combinations of ingredients and tasking the chefs with creating cohesive dishes that are at once delicious and inspired. James became Food Network’s first-ever two-time Chopped Champion. You can currently follow the culinary adventures of James and his family in their Food Network digital series’, Cooking with Dad and Man Crafted. You may also find James in live broadcasts for Food52 sharing his kitchen secrets twice a month. For over four years, James played a pivotal role in the development of IBM’s Chef Watson. He worked with the Chef Watson team to help them understand how flavor compounds and ingredients translate from a database to the real-world kitchen; James continues that work today. His innovative work with IBM has been featured at SXSW, and in the New York Times, The New Yorker, NBC, ABC, BBC, Fox News and NPR. 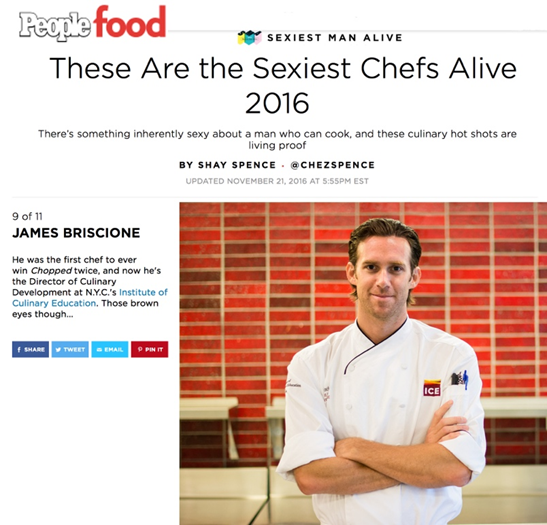 James is currently the Director of Culinary Development at The Institute of Culinary Education (ICE). After leading some of the top kitchens in United States- including Frank Stitt’s Highlands Bar & Grill in Birmingham, AL and the famed Restaurant Daniel in New York City- James found his place teaching and inspiring the next generation of great chefs. He also conducts modern cuisine workshops for professional chefs, teaching those in the industry about new flavors and techniques that they can bring to their own cooking. Refunds will be provided only if your cancellation is received by: September 10, 2017. No refunds will be issued after this date. NJEHA RESERVES THE RIGHT TO CHANGE SCHEDULES AND PROGRAMS AS NECESSARY. NJEHA has been approved by the New Jersey Department of Health as a provider of NJ Public Health Continuing Education Contact Hours (CEs). Participants who successfully complete this educational program will be awarded NJ Public Health Continuing Education Contact Hours (CEs) as applicable.